Clean Jordan Lake needs a dedicated, agile, and energetic group of volunteers in our Adopt-A-Shoreline Program to remove trash from the tailrace of the B. Everett Dam at Jordan Lake. The tailrace is where swift flowing water exits the lake below the dam. It is a very popular place to fish but unfortunately, some seem to be destroying the very place that they enjoy to come. As a member of our Adopt-A-Shoreline Program, a group would be required to clean the tailrace three times each year for three years. The cleanup includes walking on uneven rocks along the banks of the tailrace. 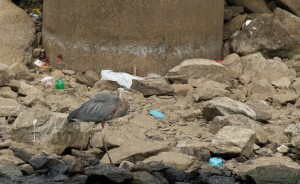 The trash and fishing line left by fishermen at the tailrace is a chronic problem. A huge amount of fishing line was collected during two previous community service days at the tailrace in November 2013 and February 2014. Nature photographer Ellen Tinsley (www.dreamingsongsphotos.com) works with CJL to document trash and its detrimental impact on wildlife and water quality. 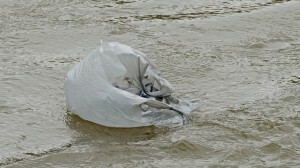 Ellen recently captured this bag of trash floating down the tailrace. Birds are ingesting plastic and using plastic bags in their nests. It is decreasing their reproduction and quality of life. It could injure the Eagles at Jordan Lake in the future. For those interested in observing an eagle nest at Jordan Lake, the U.S. Army Corps of Engineers operates an eagle camera project at Jordan Lake (http://www.ustream.tv/jordanlakeeagles). More trash has accumulated since February, just four months after our last cleanup. The photo below was taken in June 2014. In the next photograph Ellen captured fishing line entangled around the leg of a Great Blue Heron. This is not the first time that she has been able to document a bird’s injury due fishing line. In summer 2013, Ellen photographed a this Great Blue Heron at the tailrace that not only had fishing line around its leg but also an attached huge lure. This bird was obviously unable to fly correctly and hunt for food. The International Bird Rescue (http://blog.bird-rescue.org/index.php/category/fishing-gear-injuries/) has documented and rescued many birds due to fishing equipment left behind by careless fishermen in waterways. The photograph below shows fishing line tied to a soda bottle and hanging from a tree near the tailrace. The bottle serves as inexpensive reel. Our volunteers find this combination routinely. 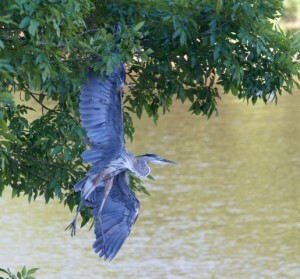 This immature great blue heron was found hanging from this tree this morning. All of its weight on the line wrapped right wing.The bird had been sighted by a kind fisherman who alerted me to the problem. While staff from the Army Corps of Engineers at Jordan Lake gathered up equipment to try and release the bird, the fishing line snapped. The heron landed in the water and waded to shore. It took a minute to fold in its wings because the right wing has a lot of fishing line wound around it. While unlikely that the bird can fly anymore, the survival instinct is strong and the bird will not give up.